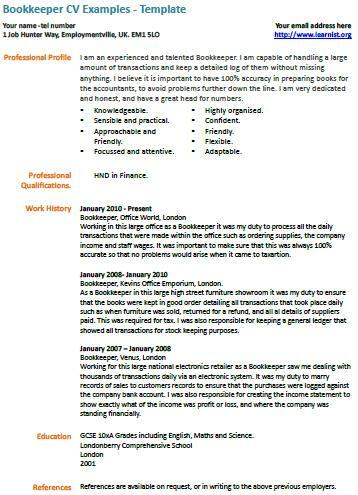 Bookkeeper CV Example – Template. If you are going to apply for a Bookkeeper job or need to update your current CV then check out this example. I am an experienced and talented Bookkeeper. I am capable of handling a large amount of transactions and keep a detailed log of them without missing anything. I believe it is important to have 100% accuracy in preparing books for the accountants, to avoid problems further down the line. I am very dedicated and honest, and have a great head for numbers. Working in this large office as a Bookkeeper it was my duty to process all the daily transactions that were made within the office such as ordering supplies, the company income and staff wages. It was important to make sure that this was always 100% accurate so that no problems would arise when it came to taxartion. Bookkeeper, Kevins Office Emporium, London. As a Bookkeeper in this large high street furniture showroom it was my duty to ensure that the books were kept in good order detailing all transactions that took place daily such as when furniture was sold, returned for a refund, and all al details of suppliers paid. This was required for tax. I was also responsible for keeping a general ledger that showed all transactions for stock keeping purposes. Working for this large national electronics retailer as a Bookkeeper saw me dealing with thousands of transactions daily via an electronic system. It was my duty to marry records of sales to customers records to ensure that the purchases were logged against the company bank account. I was also responsible for creating the income statement to show exactly what of the income was profit or loss, and where the company was standing financially.